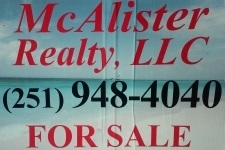 Welcome to McAlister Realty, LLC! Let my 30+ years of full-time real estate experience work for you! Give me a call and let me know how I can help make your dreams come true in your purchase of a condo or beach house down my way. Consider selling? Call me now and I can give you the most current info on recent sales, the value of your property, and current market conditions. No pressure, no worries. Just results! Give me a call or send an email when you are ready to check out the market. I look forward to hearing from you!